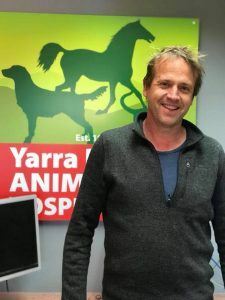 We’re luckily enough to have Chris with his extensive experience and expertise now working regularly with the Yarra Ranges Animal Hospital team! Chris graduated his Bachelor of Veterinary Science degree with honours from the University of Melbourne. His first job was in NE Victoria for 3 years in a large mixed horse, cattle & small animal practice; working all aspects but especially horse reproduction and race practice. He then travelled to the UK and worked in North Yorkshire in a large specialist horse reproduction, racetrack, performance and surgical practice. On return to Australia, Chris continued to work in both horse and mixed practices prior to co-establishing North Warrandyte Veterinary Clinic; an equine practice. He developed and grew this practice to also incorporate Yarrambat Veterinary Hospital; employing many veterinarians and nurses providing expert medical, surgical, soundness and reproductive care to horses as well as a growing small animal and farm services practice. Long time provision of services to University of Melbourne, veterinary faculty; he is involved with student teaching and student examination (equine subjects). Chris has and continues to involve himself in continuing education and has a post graduate diploma. He has regularly presented and lectured to many groups from horse owners to students and veterinarians. Chris has a special interest & a wealth of knowledge in many areas including horse reproduction, neonatal medicine & surgery, performance horse soundness management, general surgery, dentistry, imaging (X-ray, ultrasound) and geriatric medicine. After selling his ownership of his practice at the end of 2017, Chris is currently providing services to horses (and other species) in South Gippsland and the Yarra Valley, largely through Yarra Ranges Veterinary Hospital.